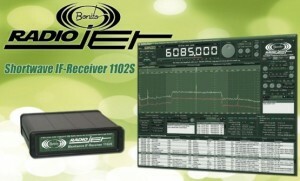 The Bonito 1102S RadioJet is the latest in PC Controlled receivers from Germany. The new Bonito RadioJet 1102S shortwave receiver combines innovative design with the advantages of modern computer technology. One unique feature Bonito pushes is the low noise floor, which they claim is extremely low, because there are no active parts between the antenna and the ADC (analog to digital converter). Strictly speaking, this radio is not a Software Defined Radio (SDR), although it is PC controlled. The Bonito RadioJet has a built-in USB Audio device and a 24kHz multi-channel IM jack. Check out our comprehensive review of the Bonito RadioJet. The electronics of this receiver has such a high integration density that it seems to the expert as if some elements are missing which so far have defined a receiver. For example, there is no AGC but three digital output channels with different signal levels. Each of these channels has -15dB ATT and can amplify or attenuate the input from -16 to +45 dB continuously. The complete large signal is scaled in 144 dB and can be read at the same time on a scale of 48 dB via the high resolution DX-channel. This receiver can process an extremely weak signal without another signal being attenuated in its neighborhood. In this way, no strong transmitter can suppress a weaker one or can over modulate the receiver to such a degree that the signal becomes unintelligible. During the development of this receiver special attention was paid to an intelligible rendering of the signal so that you cannot only view dB’s in the spectroscope but can listen to a normal QSO. The reception reports of the Bonito RadioJet will convince professionals and shortwave listeners alike. On the one hand, no completely new technologies were used, but on the other a totally new understanding of electromagnetic processes. In order to create a new receiver generation, the new physical theories of bonitistic geometry were used successfully. This entry was posted in Bonito, Made in Germany, PC controlled, Software-Defined Radios (SDR) and tagged 1102S RadioJet, Bonito, Bonito 1102S, Bonito 1102S RadioJet, Made in Germany, Radiojet, Software-Defined Radios. Bookmark the permalink.